Another project of the bee was the Brown Bag quilt. You put a partially finished project or maybe just fabrics in a brown grocery bag, and you got one to work on while someone else worked on yours. This particular one was completed by a dear friend who is now an invalid in a nursing home. It is probably one of the last projects she completed. The fabric was selected by my mother–she had in mind to make an Amish styled quilt of some sort. I have a hard time looking and working with some of her projects and I was thrilled at the result. Nishie added the lavender and dark purple from her stash. It is all paper pieced, a technique that I hate doing and so I am in awe of any project completed with such. I still have to bind it but isn’t it gorgeous? Nice to see you are finding quilting time. 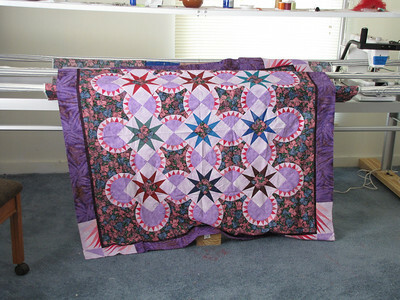 These are certainly ambitious quilts!